Dr. Nicole Apelian’s passions range from living and teaching wilderness living skills (fire, water, shelter, trapping, foraging, etc.) to prepping/emergency preparedness to her deep knowledge of medicinal plants and herbal medicine. Nicole grew up in Massachusetts and connected with nature at an early age. Her first exposure to true wilderness living however, began while working as a field biologist in Botswana in the mid 90s. Following a job as a game warden with the US Peace Corps, she began tracking and researching lions in Southern Africa and immediately fell in love with the African landscapes and the San Bushmen’s way of life. Already having a Master’s degree in biology, she later completed her doctorate while working with the San Bushmen. After developing strong relationships within the tribe, Nicole learned many of the primitive skills and ways she practices and teaches today. At home in the Pacific Northwest, she makes her own herbal medicines from local plants as part of her healthy living strategy after being diagnosed with multiple sclerosis in 2000. 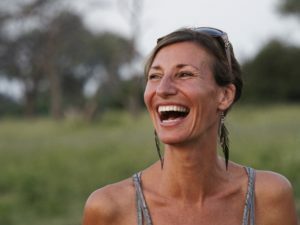 This diagnosis changed her lifestyle and eating habits, but didn’t deter her from becoming one of the founders and primary guides of her own tracking and wildlife safari company, Eco Tours International, as well as her work as an adjunct professor at Prescott College. There she brings her passion for nature connection, indigenous knowledge, ethnobotany and research to her graduate students. Nicole also thrives as a personal wellness and life coach helping people develop personalized holistic life plans, especially as related to autoimmune issues, and has her own herbal medicinal apothecary line. Nicole was also a challenger on the second season of History Channel’s TV series “Alone”. She thrived in the wilderness totally solo for 57 days with little more than her knife and her wits. She teaches workshops on her land in Oregon and Washington, and also travels to teach skills across the globe (www.nicoleapelian.com).